The best turntables of the 21st century | What Hi-Fi? As the vinyl revival has grown, 'turntables' has become, once again, one of our most popular product categories. The record players below are our Product of the Year Award-winners, and represent the best performance-per-pound turntables you've been able to buy from the past 18 years. Naturally, you can spend more money and perhaps get a better deck, but these are our pick of the best-value turntables each year based on our strictly-enforced reviewing criteria. As you'll see, the turntable category has had plenty of repeat winners over the years – and from the same handful of manufacturers too – which just goes to show the long-term value of a high-quality deck. So don't throw those LPs out any time soon. Back at the turn of the century, turntables had to make do with a cursory mention in the Accessories section of the Awards issue. Our pick for the year 2000 was a simple and straightforward set-up from Pro-Ject. It produced a “rich and detailed soundstage” and good dynamics. Combining the turntable above with the phono stage Award-winner, Pro-Ject's very own Phono Box, made this a great one-box solution for anyone looking to take their first step on the vinyl ladder. Needless to say we were impressed by the sound quality, especially the "finely layered midrange, low-frequency punch and impressive detail". In 2002 we went up a price point or three for our Product of the Year. The TT1 was based on a previous Award-winner from a company called Systemdek (the IIX). Audio Note swapped the glass platter for an acrylic alternative and tweaked the bearing, suspension springs and power supply. 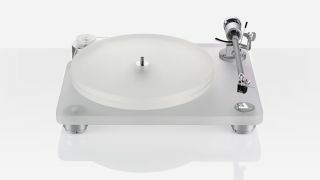 The Audio Note also used a tonearm based on Rega’s much-loved RB250, and a customised Golring cartridge called the IQ1. The results spoke for themselves, with the turntable moving us to all manner of superlatives. Amazing dynamics, masses of detail, taut bass: the Audio Note had it all. The TT1 found its reign as Product of the Year halted in spectacular style by the Clearaudio Emotion. The Emotion was cheaper, the build quality was in a different class and the sound it delivered was out of this world. It had a huge range of sonic talents, from brilliant dynamics to outstanding timing. Our only grumble was the lack of a lid - and the consequent realisation you'd need to get your duster out every so often. The combination of the deck, the Clearaudio Satisfy tonearm and an Aurum Classics Wood cartridge helped it stay at the top of the class in 2005, too. As we said back in 2005: “We’ve lived with the Clearaudio for over a year now and it continues to thrill and delight every time we take it out.” It may have looked like a Philippe Starck special, but we were under no illusions just how talented this turntable was. Pro-Ject’s Debut range of decks was dominating the budget turntable arena, but it was the new RPM5 that stood out as one of the finest products we’d tested in 2006. £400 bought you a deck and a carbon fibre tonearm, although you did need to budget for the cartridge. The end result was a turntable that delivered “all the detail you could reasonably expect for the money in a very musical manner". Rega’s P3 was based on the company’s Planar 3 turntable, but with the addition of some serious upgrades - the plinth, arm and motor were all improved. Another Clearaudio Product of the Year, but in 2009 (and keeping its crown for 2010, too) there was a new model in town: the Concept. At £1050 it wasn’t for the faint of wallet, but this ‘plug and play’ turntable was a package that was hard to resist. Everything from the cartridge weight to the bias adjustments were set at the factory to make set-up easy. It was a well-engineered, desirable deck that turned out an excellent performance, sounding at home “with everything from Nirvana to an old mono recording of Ravel's Boléro". This is, frankly, getting a bit ridiculous now. But Rega's unchallenged winning streak has been decades in the making, and this model can trace its lineage straight back to the original Planar 3 from 1977. Since 2011, the Rega 3 has been one of the most successful Award-winners in recent memory and has definitely earned its place on this page. Essentially a refined version of the Rega P3 winner from 2007, the RP3 introduced minor adjustments to its RB300 tone arm and extra structural reinforcements. The current Planar 3 underwent more "seismic" changes in 2016 - redesigned main bearing, sturdier plinth, new finishes, a new RB330 tone arm - raising the performance to untouchable heights in this price range. Still going strong in 2018, the Planar 3 is the deck to beat.